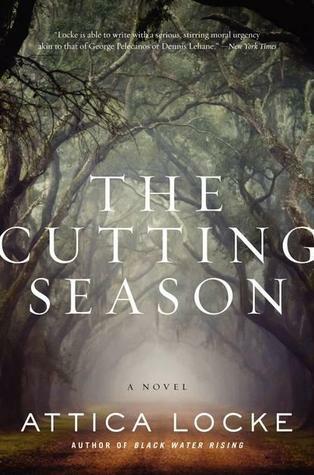 The Cutting Season is a murder mystery by Attica Locke set on a historic Louisiana plantation. A migrant worker's body is found one morning out past the old slave quarters, and her death seems to have many parallels with a man who went missing more than 100 years ago from the same area. Caren Gray is the manager of historic Belle Vie plantation. She grew up there, helping her mother in the kitchen. And several generations of her family have worked there, many as slaves. Now she lives on the plantation with her 9-year-old daughter, and her family is comprised of the other people who work at the historic home. When one of her co-workers is arrested for the murder, Caren gets deeply involved in working to clear his name. In her book The Republic of Imagination, Azar Nafisi talks at length about the Southern novel in American literature and her discussion with a classmate about how it is distinct from all others, and can only be fully understood by someone from the South. It's lucky that I read The Cutting Season right after finishing The Republic of Imagination because I can see what Nafisi's classmate meant. There is so much Gothic atmosphere in this novel, you can practically smell the heady scent of flowers and feel the weight of history on the shoulders of everyone even tangentially connected to the Belle Vie plantation. I haven't spent a lot of time in the south, but Jenny says that Locke does brilliantly with this, and I trust Jenny as a true southern gal to know what's authentic. Reading The Cutting Season in the midst of the Ferguson and NYC grand jury aftermath, with the massive distrust that currently dominates the relationship between minority communities and the police, a lot of the decisions and actions that Caren and the other characters made were much more understandable. I can see why none of them wanted to involve the police (and, as the police were not particularly effective, why they were so frightened that everything they did and said would be misconstrued). I appreciated how Locke really brought these to life - even very successful, very intelligent people were scared of what the police might do. I also appreciated the way Locke mixed current events with historic ones to show just how completely the past impacts the world we live in today. It was so well-done, having Caren learn more and more about her own past and what happened on the plantation generations ago and have that story parallel the one happening currently. It brought up all sorts of themes that Locke alluded to but never went into great detail on - the case for reparations, the source of money for so many wealthy families, the consequences of trying to ignore or eradicate historical fact. Not to mention the parallels between the death of a slave and the death of a migrant worker. Seriously, so many levels! And Caren's own personal history of going to law school and then dropping out, and her reasons for doing so, and the way her employer kept saying things to her like, "You know, I've done so much for you and your family over the years" as though her family had done nothing for him and his family over the years, and how Caren interacts with the plantation family - all of it is so good! If you're itching for a super-atmospheric mystery novel, this is a good one to try. Especially if I have gotten you hooked on Malla Nunn - Locke creates the same stifling atmosphere, brings up similar points about racism and its effects, and the complications that can arise from family drama. I'm so glad you enjoyed this! It was one of my favorite reads last year. After I read it, I just had to go read her book, Black Water Rising. Loved it too, but maybe not quite as much. It also deals a lot with issues of distrusting the police, as well as other important issues, but it has a grittier feel, if that makes any sense. Locke is such an amazing writer, and I hope she publishes many, many more books! I plan to get around to Black Water Rising this year, too - and am so looking forward to the sequel to that book coming out, too! This looks great. I've been meaning to try Locke's work for years so maybe this year I actually might. It's interesting what you say about Southern literature and its many layers which may not be initially evident to many non-Southern readers. Will keep my eyes peeled. Yes, I thought it was a really interesting point, too. When I read this, I was initially really frustrated at how Caren wouldn't just talk to the police, but the more I read the more I realized that she had good reason to be fearful. And of course the headlines these days show this wasn't just some theoretical fear cooked up for fiction. I'm looking forward to her next book, coming out this spring--and I've still got to go back and read her first, which I've heard is very good. Yes, I agree - I think recent events have put that fear into context for me and it makes much more sense than it might have otherwise. I have to go and read the first, too. Ooh, maybe we should read it together! I didn't realize the new book was a sequel to Black Water Rising. And I have an e-galley of it and everything! I wonder if I could fit the first book in before the new one comes out--reading it together could be fun! I really enjoyed this as well, which I've just recommended for one of my book groups. I live in Texas, just over the border from Louisiana, and I think she got the atmosphere right. I'm excited to hear she has a new book coming out. Someone in my office also mentioned that she is an executive producer on the Empire series on TV. Oh, how cool! I had no idea that Attica Locke was working on Empire now! That makes me want to watch it even more than I already did. Yes, she has it all over her Twitter feed, which I have started to follow. I didn't love the first episode of Empire. It's definitely a very different vibe than this book. Thank-you for sharing your thoughts on this novel. I just ordered this book as part of my list of readings for Black History Month. I`m looking forward to reading it.